Please patronize our advertisers, they're the people that make this possible. So what in hell is a Wide Screen Time Machine? This is where we'll stick all sorts of goodies dating back from the late 20's through the late 60's that show more than just the technical side of the wide screen revolution. Some items may not even be film related, but they'll be used to help provide an image of the times and attitudes that prevailed during this very fruitful period. Like all other aspects of The American WideScreen Museum, the Time Machine is a dynamic showcase that will change and grow constantly. The folks at 20th Century-Fox opened the doors for just about every main stream magazine to report on its upcoming CinemaScope process. 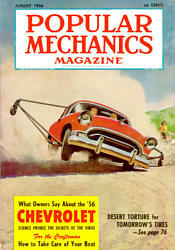 The August, 1953 issue of Popular Science hit the stands just weeks before the premiere of The Robe. There are five pages of photos and text reproduced here. Mike Todd, following in Cinerama's footsteps, promoted his TODD-AO production of Around the World in 80 Days by inviting Popular Mechanics magazine to report on the special effects work done for the film. This 8 page article appeared in the August, 1956 issue. What could be a more appropriate premiere entry than this August, 1950 article about Super-Movies? This is Cinerama before even Lowell Thomas and Michael Todd saw it. 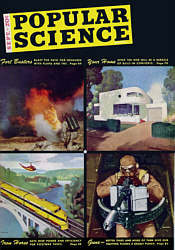 Popular Science was so impressed that they began the article on the front cover of the magazine. Some of the photos and diagrams are extremely rare, and they're a hoot to boot. Click on the cover to read the story about Super-Movies! Thank's to Richard Prey for his generous help in making this available. 1943 Article on the Waller Gunnery Trainer. 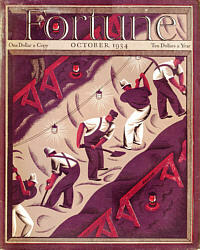 Fortune Magazine October 1934. An exhaustive report on the people, technology, and financial aspects of Technicolor, Inc. written just after the completion of the first live action short subject, La Cucaracha. Excellent full color illustrations! 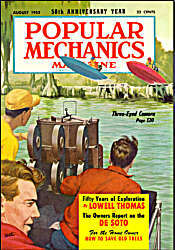 Popular Science September 1943. The Waller Gunnery Trainer, predecessor of Cinerama, is featured in this article that shows what "Virtual Reality" devices looked like in World War II.